Thought, reason, and the abstraction of composite thoughts or paths to thoughts…Thoughts about the metaphysical from the experience within and of this physical world. Rather than to sit at this impasse, I will – as it is the future – defer to a short youtube clip. Consider the illustration below (from the Wikipedia page on gravitation). Although we see that the massive object distorts the ‘fabric’ of space like a billiard ball onto a cloth, the image does not do justice to our three dimensions. 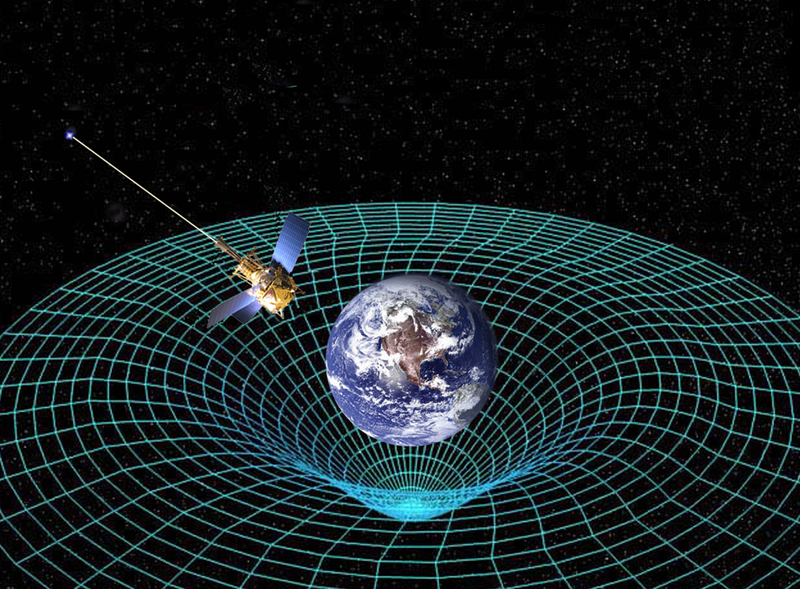 The three-dimensional gravitational effect is probably a little more difficult to illustrate than it is to conceptualize. Consider the video below as well (even if only briefly). What exactly is it about objects, about mass, and even photons in light that so orders the Cosmos? Does each corporeal bit desire to go ‘down’ as the ancients thought? Probably not. Could it be, as I have heard, a stronger force in another parallel demi-Universe which affects ours only weakly? That sounds silly, but much of the quantum and theoretical sounds silly. If I may share an unfounded thought concerning gravity in this world. What if beyond what we can experience, be it on/in another dimension, or on the ‘other side’ as it were of the stuff which is our Universe, that something seemingly quite proper in its own right, and not in any way indicative of the presence of this apparent cosmos as we know it, were to exist. Imagine a table. What if to us the surface of the table was the table, and no matter how many centuries of science or however delicate or intricate the measuring tool, the top of the table was everything, and beyond that there was no table. What if elsewhere (a word with no defined meaning here) someone were to look at that same table, and no matter their patience, power, or thirst to know the table in its entirety, they knew only of the bottom of the table. What if in this sense, gravity is the effect felt in this place by something effected here… but also elsewhere. What if each corporeal bit which came into existence in this Universe was in fact elsewhere a tiny hole popped through the a membrane through which pours something analogous to sand or water, something fluid but substantial. energy itself. The behavior of the flowing substance and the holes which converse, in effect this other (in the greatest sense) cosmic ocean would then effect ours in the way which we see it. Like those who exist on the skin of the balloon, we would know nothing of a balloon, and therefore couldn’t possibly entertain anything pertaining to this other thing which might have its own physics and … etc. anything. I am at a loss for words. The closest I am able to conceptualize is a when I try to fit my human brain into the situation (as I may here pretend to know) of a fish in a fish tank atop a kitchen counter. To then, as a fish, consider not simply an environment beyond what is visible, but to argue for a house outside of which is human civilization, itself a tiny spec in a vast vast vast fishbowl. That kind of information which exists so beyond the reach of the fish no doubt exists for us too as humans. Though we are the smartest and most capable things around, we know only as much as we can convince ourselves that we know. Beyond that exists probably more than what exists within our collective cognition. This is not to say that I believe that we exist on the side of some unfathomably massive balloon, nor do I believe that gravity is as I have above pulled from my mind. Just playing with thoughts… thinking about the limitations of perception, of thought. This entry was posted in 2014, conjecture, Space, thoughts, Uncategorized, Universe, writing and tagged cosmos, gravitation, gravity, space, universe. Bookmark the permalink.